There are quite a few different ways to join crocheted squares together. In this tutorial, we'll go over one useful method to know; how to join squares using a slip stitch. You'll need two elements to join. This demonstration is with afghan squares, but you could use this technique to join other things such as the seams on garments. Crochet Hook: It's best to use the same crochet hook you used to crochet your squares or pieces. Yarn: For best results, use yarn (or crochet thread) that is the same fiber and same general weight as your squares. 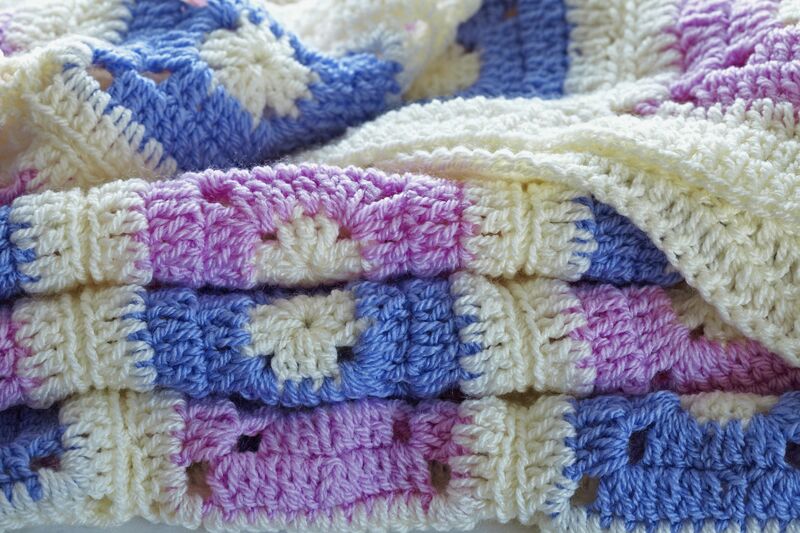 To crochet the join, you'll use a yarn color that matches your squares. The demonstration uses a contrasting color so the work is visible. But for joining these squares permanently, you would choose a color used in the outermost rounds of the squares. Since the slip stitch join is asymmetrical, work from the wrong side. Technically, it would be possible to join the squares from the right side of the work, but the asymmetry won't be noticeable from the wrong side, whereas it would be on the front. Hold your squares together with the wrong sides facing outward and the right sides facing each other. Decide which loops you want to work through. You'll get different results, depending on which loops you choose. For this tutorial, you are working through the outer loops, meaning that when you hold the work facing you, you are working through the front loop of the square closest to you, and the back loop of the square farthest from you. If you'd prefer to work through the inner loops, you could do that instead. Either method will give you a reasonably sleek join. Do not work through all four loops unless you want a hefty (and uncomfortable) join with an obvious ridge on the wrong side where the pieces are joined. Insert your crochet hook into your chosen loops, as pictured. Unwind a bit of yarn and prepare to pull up a loop; you'll want to leave at least six inches of yarn at the end to be woven in after you are finished joining your squares. Hook your yarn and pull it through the loops on both squares. Here's how it looks when you've pulled up your loop. Insert your hook into the next set of loops to be worked. Grab the yarn with your hook. Pull the yarn up through the loops to form the next slip stitch. Here's how it looks when you've finished that step. Insert your hook into the next set of loops to be worked. Grab the yarn with your crochet hook. Here's how it looks now that the second slip stitch is complete. Keep crocheting slip stitches until you've worked your way all the way across. Here's how the work looks on the wrong side. Here's how it looks from the right side. This close-up photo gives you a better idea of how the join looks from the right side. There are many possible ways to join crocheted squares, such as by using a whip stitch.